Those words were said the day before. Now, 15 minutes after moving in, we’re sitting in the upstairs bedroom, glass doors tightly shut, plotting our escape. One of our captors sits on the other side, casually stating his territory. He’s one of the bigger of the bunch, but less aggressive in his nature. Nevertheless, the message is clear: this is their house and they will fight to keep it. Steve’s nemesis appears at the window. A scrawny fellow with a fierce temper. He bares his teeth and wipes his gums across the glass, smearing his saliva, and trying one last time to find his way in. I whimper, terrified he and his cohort might smash the glass or sneak their way through the rafters. We’re surrounded by a gang of around 15, and their desperation to get in makes my mind run wild around their intentions. Don’t these guys fight to the death? Could we overpower the pack? When they first arrived, we thought them curious, cute even — here to check out the neighbours, perhaps see if they had some food. We knew they’d likely be a pest, but never imagined they’d be a threat. Within minutes of our arrival, they emerged through the trees, slowly working their way closer, some sitting on the wall, others on the roof. What started as delight quickly turned to alarm. And at that, Steve made himself as large as his six foot allows and shouted loudly at the intruders. Mr. Scrawny-fierce immediately retaliated, baring his teeth and nails as he came at Steve aggressively, his cohort poised for support. “Quick, get in here,” I called from the bedroom. We slammed the screen doors shut, just in time to trap the menace on the other side. He perched on the balcony, eyes locked with Steve through the glass, and pissed down the stairs, while his mates rolled around brazenly on the sofa just behind. Their message and fearlessness were clear. We were trapped. Sitting in the bedroom of what was meant to be our new home, we knew it couldn’t be. The house had been empty for two months and had clearly been claimed by this band of Macaque monkeys. We couldn’t live there and feel safe. Not only were the monkeys vicious, but many of the local population are known to be riddled with disease – rabies and the fatal B Virus. We had to leave. The only question was how, when they had us from every angle. Luckily, we knew Gade, the agent who had rented us the home, was already on his way over to sort out some final details. We sat in anticipation, trapped in our glass-walled room, waiting for the sound of his scooter. Neither Steve nor I had any knowledge of Macaque behaviour. 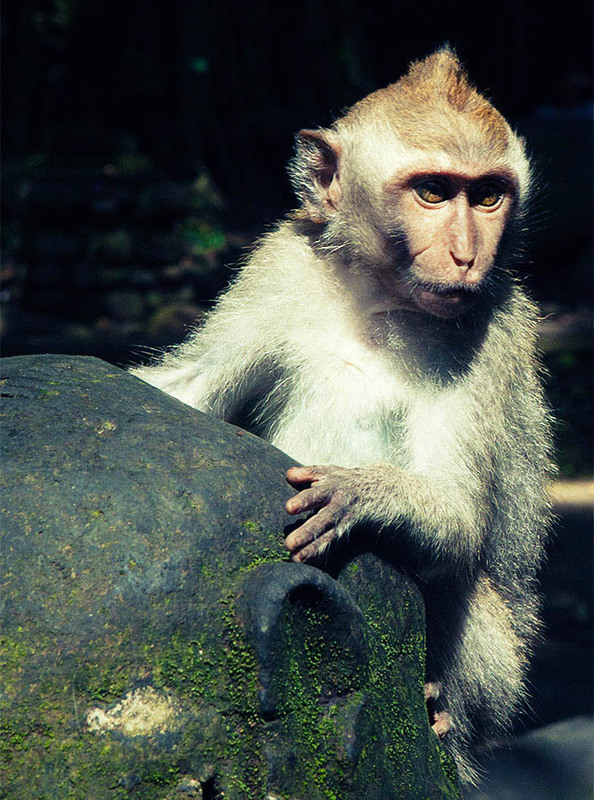 In the nearby Monkey Forest, they are rarely aggressive unless you’re withholding food. This was an unprecedented situation: we were challenging their territory and they were furious. Having watched my fair share of nature programmes, I knew that was a serious move in the monkey world. What I didn’t know, and could only imagine, was what 15 muscular and toothy monkeys would do to two human perpetrators if they got the chance. ‘Catastrophic thinking’ would be a good way to describe my response. Steve, meanwhile, cracked out his computer and started to work. He was certain they couldn’t get through. And while it’d be more dramatic and make for a better horror story to say he was wrong, I’m delighted to say he was right, and no monkeys made it into our fort. In fact, by the time Gade arrived, a long 20 minutes later, it appeared most of the monkeys had dispersed, the remaining ones distracted by a local offering bearing fruit. We quickly gathered our belongings and rushed out the gate, passing the tell-tale territorial along the way. 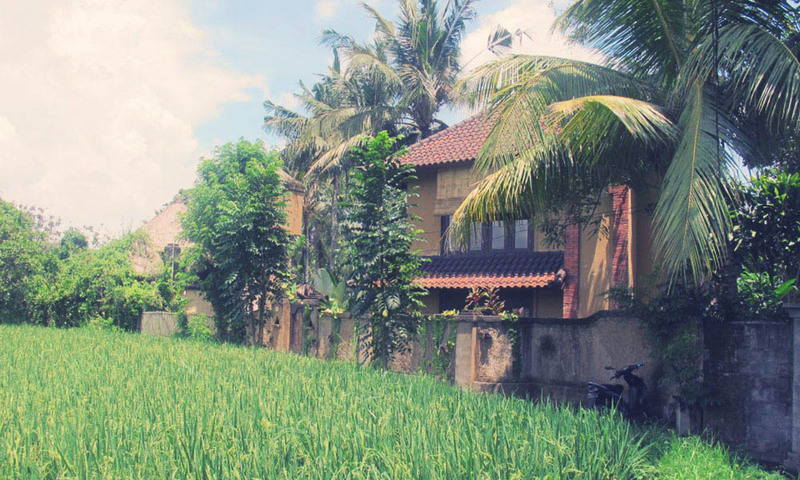 We were out and safely back at square one, homeless in Ubud, but with two important lessons learned: listen to your gut when it says a new home seems like the set of a horror movie; and never ever ever move into a house occupied by monkeys. The monkeys pictured here are not the ones that tried to attack us. I’m afraid I was too busy panicking to crack out the camera! These are also smaller. It’s the chunky male ones that worried me most. Our advice is to always be careful around monkeys. They may look cute, but they can also be very aggressive. We got into trouble in Bali because we moved into a house that they had claimed as their territory. This was an unusual situation, but a good reminder that monkeys are not always afraid of humans. People also often have problems with monkeys and food, especially in touristy place where monkeys are used to being fed. If you have food on you in an area like this then the money will do their best to get it. If they try, I’d advise just giving it to them rather than risk their aggression. Monkeys carry a lot of diseases and it’s simply not worth the risk. Of course, some people choose to feed the monkeys, which exacerbates the situation and is also risky as the monkey may bite / scratch if they want more. Don’t expect them to shake your hand and say thanks! It pains me to say this as I used to think that monkeys were simply wonderful and that I could interact with them without fear. Nowadays, I still think they’re wonderful but I keep a respectful distance. OMG, that is nuts! Glad your fort worked to keep the monkeys out. I like monkeys, but I’ve never been in a situation like yours, it seems quite scary! I love monkeys and was actually really excited to be living next to the Monkey Forest. It changed the moment we realised they weren’t afraid of us and actually seemed to want to hurt us! Like any monkey’s they can be dangerous. I have a 2 1/2 Longtail Macaque and he is a great pet. Money love to bite. The way you train not to bite is you bite them back when they bite you. Yeah, that can be scary also, but that is how I trained my monkey. His name is Rockie and everyone love Rockie in our area. The kids love him. I would have been genuinely terrified. Monkeys scare the hell out of me. They’re like possessed children. That’s a great description of the Macaque Monkeys! Scary! I’m glad you guys made it out safely and hope you’ve found a new place in Ubud. We have! And it’s much nicer so everything worked out in the end! What a shame because this house looks amazing. But I totally understand. Macaque monkeys are terrifying and I saw some nasty attacks in Monkey Forest. Good luck finding a new place! Our new place is luckily much nicer. We have a pool! Scary!! When we went to the monkey forest I was so afraid of the monkeys. They were very aggressive and I saw 2 people walk past with bite marks on their stomachs! Glad you got out of that house, I wouldn’t have been happy or comfortable there either with those house mates. I was so surprised at how aggressive they are. We’ve since been to the Monkey Forest, and while they were better behaved in there, they were still pretty scary! A monkey came into a restaurant the other day and showed no fear until the owner appeared with a shotgun. The monkey took one look and fled! Woah! That’s totally crazy. I used to wish there was monkeys in San Pancho. Glad you survived relatively unscathed. Much love! Steve and I were talking about that the other day. lack of monkeys is now another plus point for San Pancho! That definitely sounds scary! I felt as though I was there. Intense! Glad you’re ok! I’ve seen a few monkey muggings in my time! Not nice! We went to the Monkey Forest the other day and saw so many monkey muggings, it was crazy. The monkeys are completely out of control! And all this time I’ve been thinking that monkeys are CUTE! Well, maybe cute in those pictures but clearly not in real life. Glad you made your escape and good luck with the house hunt! Oh no, don’t be put off by this post or the monkeys. The house was right behind the monkey forest, literally about 100 metres away. Just make sure you don’t rent a house to close to it. The monkeys never come into the town, which is pretty incredible. I’m not sure how they’ve been trained not to do it, but it’s worked. So, please don’t be put off. Our situation was quite remarkable! The monkeys in Bali are not everywhere. Just some spots that can easily be avoided. Like you, I really do not like them. Bad experiences in India with them also. Wow! Sounds crazy. Glad to hear you guys are well. It’s crazy how vicious monkeys can be. They are incredibly persistant little guys and wont stop until they get what they want. It’s a shame though that place looked awesome! Oh my word!!! Even when we walked for the monkey forest we were not so sure about them. Hope you found somewhere. How long are you there for as we might be there in January? 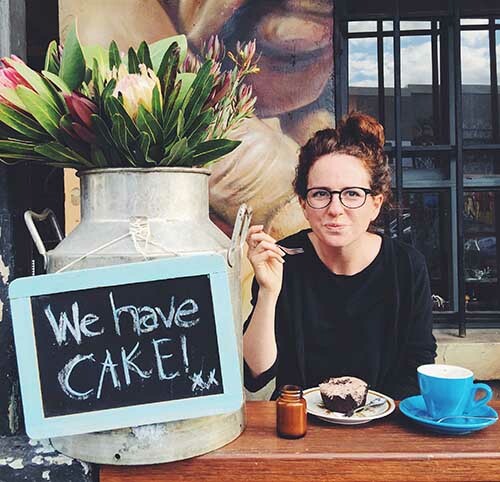 Some great places to eat in Ubud! Oh no! I am so scared of monkeys! Crazy animals. Did you end up finding a house without monkey squatters all over? This sounds terrifying – glad you got out alive and good luck finding a new house! 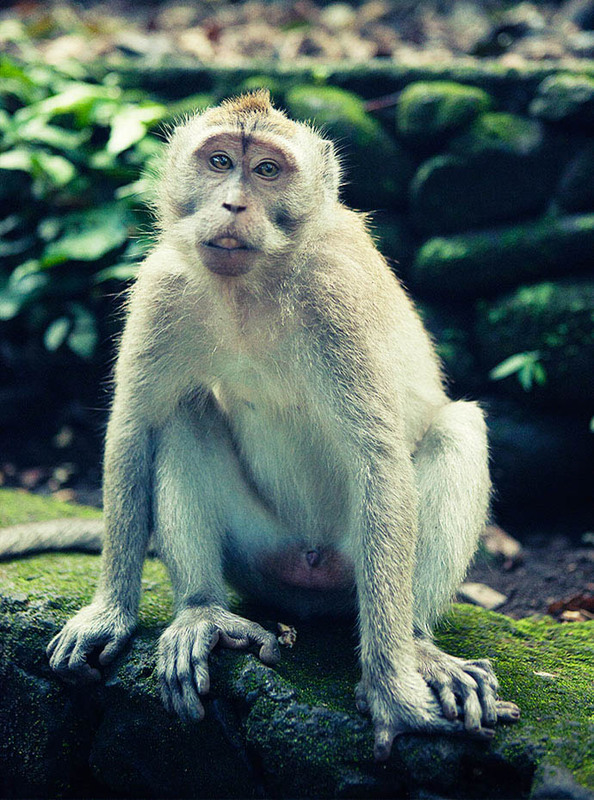 I went to Ulawatu Temple with a couple of friends when I was in Bali and one of the monkeys snuck up from behind and stole one of her earrings right from out of her ear; without even ripping her flesh! And I won’t mention the time I saw someone get attacked at Victoria Falls for her handbag – all they got in the end was their bottle of water but it was terrifying! This is hysterical! I thought, at first, that you were talking about bugs, or giant geckos. I often feel like we are shut inside our bedroom at night because of the mosquitos, but they have not been as bad recently. We also have a giant tokay gecko living in the rafters just outside our bedroom door who leaves giant gecko poop on the floor. We try to get in and out of our doors at night as quickly as possible – to not let the mossies in to the bedroom, and to avoid getting pooped on by Fred the Spotted Tokay Gecko. It sounds like something out of a B horror movie! You were definitely right to leave, I got bitten by an unprovoked monkey before so they are not to be messed with! Yep, they’re vicious little creatures aren’t they?! I think we just signed up to rent that house! We’ve been living a couple doors down and the monkeys are aggressive. I’m hoping the current renters have re-claimed the house from the monkeys. Oh my. Be careful! It was a pretty terrible experience.